What’s amazing about this video is I shot it on a fluke and it has received over 28,000 views to date. To sign up for the YouTube Partnership program, a video producer must review YouTube’s instructions. Once a producer has accepted YouTube’s Video Monetization Agreement, they must link their video to a Google Adsense account and then answer some simple questions about their video. Once a video has been successfully submitted for revenue sharing consideration and if it is approved, the video producer will start to see ads displayed next to their video. Processing a video for consideration can take up to 2 weeks. 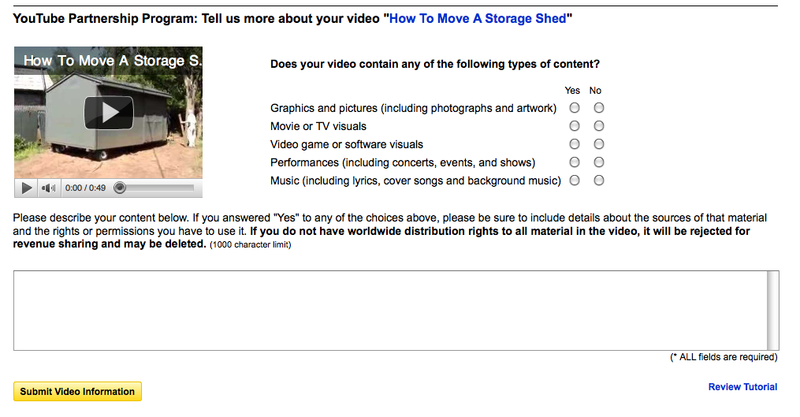 This entry was posted on October 23, 2010 at 8:10 pm and is filed under Google Adsense, How To Move A Storage Shed, Video Monetization Agreement, YouTube Partnership Program. You can follow any responses to this entry through the RSS 2.0 feed. You can leave a response, or trackback from your own site.